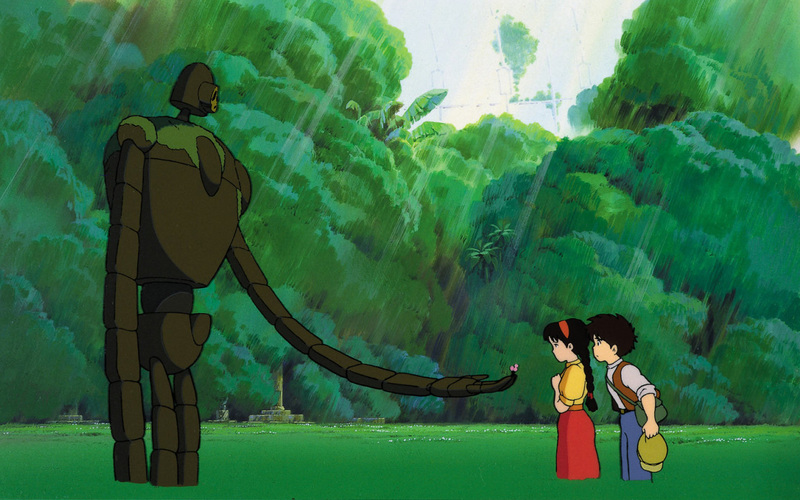 So, on the first of these “Miyazaki Mondays,” I viewed the very first official Studio Ghibli film (though not Miyazaki’s first) — Laputa: Castle in the Sky (1986). Unless otherwise noted, I’ll be watching the Disney US releases of these movies, which feature what I consider to be quite excellent (though highly stylized) voice acting from a range of (more or mostly-less) notable talents. Laputa contains vocals by Mandy Patinkin, Cloris Leachman (as Dola, haha! ), and a very young Anna Paquin, among others. Laputa‘s animation is not quite as crisp and detailed as most of Ghibli’s work … but this was still the 80’s, haha. And what it’s lacking in visual detail, it makes up for with its adventurous yet still (again, characteristically) sentimental story. From the gentle hilarity of a band of bumbling sky pirates led by their brash and boisterous mother, to the ever-evil government and military cronies, to the gorgeous sky-city with its peaceful garden and its silent yet dedicated guardian, Laputa delivers two hours of refreshingly innocent and fantastically engaging amusement.